Villa Thalia Vacation Rental in Crete, Greece. Pool. BBQ. Views. Sleeps 6. WE BELIEVE VILLA THALIA IS AN AMAZING EXPERIENCE. BUT LIKE EVERYTHING IN LIFE, WE HAVE DIFFERENT TASTES PARTICULARLY WHEN IT COMES TO HOLIDAYS, SO HERE ARE A FEW THINGS TO THINK ABOUT BEFORE YOU BOOK. Yes. Villa Thalia is a privately owned house and business registered in Chania, Crete and is registered for VAT in Greece. Villa Thalia is also licenced by the Greek National Tourism Organisation www.visitgreece.gr known as EOT (Ellinikos Organismos Tourismou) and our licence is 1042K123K2554601. 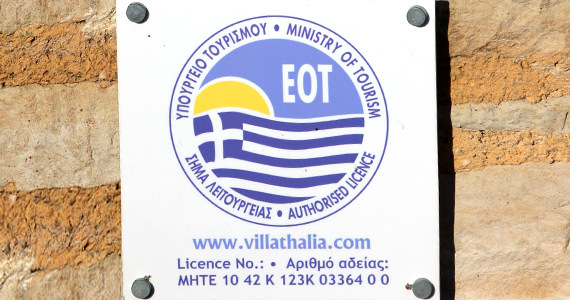 Villa Thalia is also registered with the Confederation of Greek Enterprises for Rented Villas and Apartments in Chania. We therefore comply with all necessary Greek government regulations to ensure our property is safe and of the exacting standards issued by the Greek Tourist Office and in most cases we exceed them. We can stock the house with food and drink if you wish on your arrival. IS VILLA THALIA IN A TOURISTY AREA? IS VILLA THALIA CHILD- OR SENIOR-FRIENDLY? CAN VILLA THALIA SLEEP MORE THAN SIX? In short no as the house is licensed by the Greek National Tourist Office for only up to six people. IS THERE A LIFEGUARD FOR THE POOL? You are welcome to use the pool as you would expect but, as you would expect with a private house, there is no life guard on duty. Our team in Crete will carry out regular inspections of the pool as required to make sure the the water quality is safe to swim in and the safety equipment is complete but the use of the pool is at your own risk. Feel free to send us a message if you have further questions, we will be happy to answer them for you.